Hopefully you are as excited as I have been with the market decline the last couple of days. Notice that I said excited, not freaking out like so many people seem to be doing. During the accumulation phase of our journey towards financial independence, down markets are a positive thing because it allows each dollar to buy more shares of our preferred stocks. And when it comes to dividend growth investing in particular, lower prices equate to a higher dividend yield and therefore more return on our investment with each dividend that is paid out. That is why I have been so excited to see prices dropping as it is allowing me to deploy new capital and continue building that forward dividend income! If you’ve ever come across a NAPA AUTO PARTS store, you already have some familiarity with Genuine Parts Company. One of their primary business segments distributes automotive replacement parts through 57 NAPA distribution centers and over 1,100 NAPA retail stores. 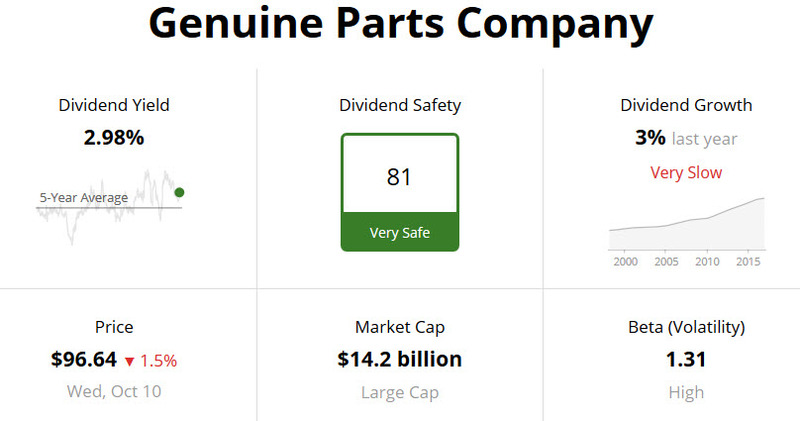 Rather than go through all of the detail on the company, I would encourage you to check out Tom’s dividend deep dive on Genuine Parts Company over at Dividends Diversify. For those that like to know the history, Genuine Parts Company was founded in 1928 and is headquartered in Atlanta, Georgia. While not the type of growth demonstrated by another recent buy–Snap-on Incorporated–Genuine Parts Company has maintained this level of growth for many years. That level of consistency is a great thing to see in a dividend portfolio. The snapshot above demonstrates the Dividend Safety score of 81 as calculated by Simply Safe Dividends. They calculate their dividend safety score by evaluating multiple financial factors to determine the likelihood of a dividend cut–which as dividend investors is something we definitely want to identify as soon as possible. While the dividend yield shown here was 2.98%, based on the continued market decline today I was able to make a purchase with a dividend yield of 3.03%–which is nearly 11% above their 5-year average dividend yield of 2.73%. 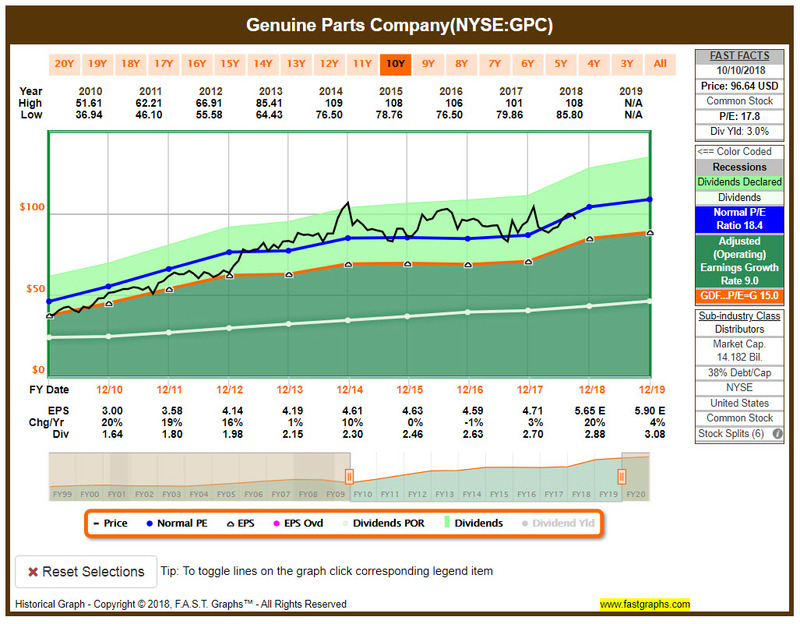 Here we see that Genuine Parts Company has maintained a payout ratio in the range of approximately 50-57% for the last 10+ years while their earnings per share has generally had a nice upward trajectory. As mentioned earlier, based on the price movement today the dividend yield moved a bit higher above their 5-year average dividend yield and their P/E ratio is below their 5-year average ratio. Both of these factors indicate that GPC may be undervalued, therefore I like to cross-reference that by taking a look at FAST Graphs. Looking at FAST Graphs, we see that the price has dropped slightly below their normal P/E ratio as calculated over the last 10-year period thereby supporting the possibility that the stock is undervalued right now. From a risk perspective, Genuine Parts Company did take on approximately $2 billion in debt to complete their acquisition of Alliance Automotive Group in 2017. However, by acquiring AAG, Genuine Parts Company now has a broad presence within Europe given that AAG was the second largest parts distribution platform in Europe. You can see the impact of the Alliance Automotive Group acquisition here, as they closed the deal in the 4th quarter of 2017 and their free cash flow margin had a noticeable decline. 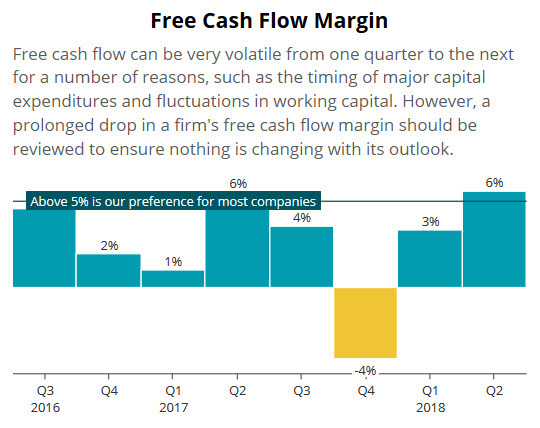 On the positive side, the first two quarters of 2018 have seen their free cash flow margin increasing and their debt levels decreasing. This market has presented another opportunity to add to a position from my October dividend stock watch list, and as noted there, I was ideally looking to purchase GPC around $96.00/share which equated to a 3.0% dividend yield. The 10 shares purchased at $94.80/share will add an additional $28.80 in forward dividend income. Overall, this increases my position in Genuine Parts Company to 21.166 shares. In addition, if the price continues to move down, I am prepared to make a secondary purchase to add an additional 10+ shares to the portfolio. With my Snap-on purchase, I was able to follow up my initial buy with a secondary purchase at an additional 5% discount. 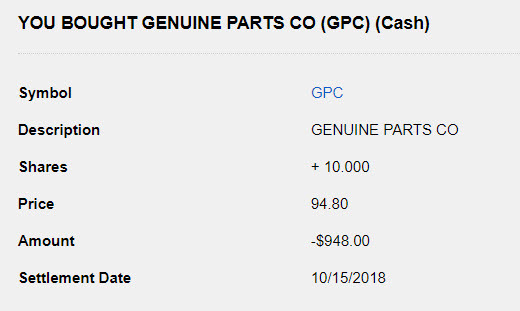 Therefore I will be targeting a price of $90.06 to $91.95 for a secondary purchase of Genuine Parts Company. The increase in forward dividend income now brings my portfolio to $4,817.02 in total forward dividend income. As I am closing in on my goal of receiving $2,500 in dividends from my new DGI portfolio in it’s inaugural year, I am also setting my sights on trying to reach $5,000 in forward dividend income. Based on my portfolio’s average dividend yield of 3.14% this would require an additional $5,800+ in capital invested by year’s end. With my target of adding $2,000 to $3,000 in new capital monthly, this should be achievable depending on what stocks I am able to purchase the remainder of the year. While I know that there are quite a few people that seem to be panicking with the recent market decline, I truly am excited because this pullback is providing more plentiful buying opportunities. I’d venture that some of those in a state of panic may be relatively young and either did not experience the Great Recession or had limited funds invested. It is critical to remain true to your strategy and view declining prices as an opportunity to add shares at a discount. With that said, don’t blindly buy shares just because the price is lower. Be sure to still follow your defined guidelines and do your due diligence to confirm that the fundamentals of the company have not changed. In the case of Genuine Parts Company, as well as my two recent buys of Snap-on Incorporated, I am confident that the fundamentals remain strong and the declining price has been a great opportunity to buy more. We are about half-way through October, and I hope that there will be more to come as well. What are your thoughts about my purchase of GPC? Those are valid threats, however with the electric cars and ride sharing, in my opinion, those are still relatively slow to be adopted and it might be 10+ years before that begins to have a noticeable impact. Re: Amazon, I think GPC has a supply chain and logistics network that can actually stand up to Amazon, as many of the auto shops, dealers, schools, etc. need extremely rapid turnaround and GPC accommodates that. The other aspect about Amazon is that many DIY’ers need / want some of the guidance offered by staff in selecting the correct parts for their car, and that is difficult to replicate online. With that said, it would be short-sighted to think any one of these threats cannot cause an impact to GPC. However, I believe they are fairly well insulated to those threats for the time being. I debated buying them in the past but went with another us stock at the time. Love the dividend history of this stock! Honestly, when building my portfolio I almost didn’t include their stock in favor of some others as well. However, knowing how much my boys and their friends run there for a part while they’re working on their cars and how often the high schools here order parts from them, I decided to add them. But as you say, it’s quite a distant future, so the company still looks good and may remain so for the next 10 years. Furthermore, they should be able to adjust their business model to stay competitive – I am sure that they are thinking about the risks in their sector. Thanks for sharing the articles BI, although the 2nd one only provided a short snippet as it looks like it requires membership. Certainly gives something to think about, however even in the Bloomberg article it estimates by 2030 that the shared or autonomous vehicles will only account for about 10-12%. Also, shared cars and autonomous fleets will still require maintenance and replacement parts–although as you noted that could be done directly by manufacturers with their own parts. It will be interesting to see how car manufacturers and companies like GPC manage this gradual shift, but I do believe it will be a slow transition. Oh, sorry about that other article. I guess the old articles can only be accessed by subscribers (I love Economist and it’s the only subscription I have for years). No worries at all. I appreciate the dialog as considering different perspectives is what can make us all better investors in my opinion, so it has been helpful to read the one article and take that into consideration. Nice buy. Was looking hard at them but ultimately went with a healthcare stock. I think it’s a natural reaction to panick but smart people will see a buying opportunities are available. Keep it up. Thanks Doug, what did you buy in healthcare? I was looking at your site to find the buy but was either overlooking it or that buy wasn’t posted. There’s a few I like in the healthcare sector but I am a bit overweight there right now. Cool, look forward to checking that out.